The first two chapters are riveting. Chapter 3 is jam-crammed full of very specific information about the programs and companies and interconnections used in contemporary government surveillance, not boring or tedious but often over my head. And Chapter 4 is about the dangers of this kind of surveillance . Chapter 5 concerns the role of the press and the dangers currently limiting the freedom of the press. Those last two chapters are journalism of the somewhat polemic variety. Nice introduction and then bang – we’re into the story – a real-life, fast-paced thriller as Greenwald tells the story in a 1st person sequence of events unfolding as he and Laura Poitras, a noted maker of film documentaries, got more involved. But there’s plenty of substantive meat to chew on as well. Some of the questions Greenwald asks along the way include: what exactly were the government surveillance operations which made headlines when they became public? 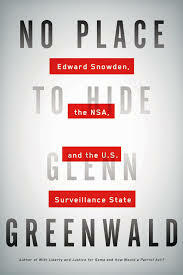 What makes Snowden tick and why did he turn whistle-blower on the whole US security operations? How does the media help and/or hinder in cases like this – huge scoops which might embarrass the government, scare the public, reveal criminal activity – is there some form of censorship going on as well as surveillance? Greenwald tells us not only what Snowden revealed but almost more importantly, how he revealed it and how he hid and got away with sufficient background material to help really grasp the significance of the disclosure, the difficulty getting the reports and documents published and the seriousness of the consequences for Snowden and others involved. I think he could have been more detailed about the documents themselves, what they contained and what the ramifications are but I suppose there are a lot of sources for that material now. And what Greewald shares is a tale in its own right as told by a true story-teller.